View a photo album on the district’s public Facebook page – you don’t need a Facebook account. 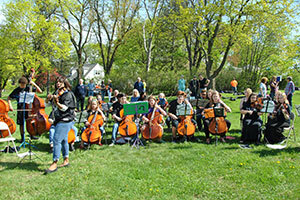 Many Warwick students took part in this year’s Arbor Day ceremony on April 28 in Stanley-Deming Park, co-hosted by the Village of Warwick and Warwick Valley Gardeners. 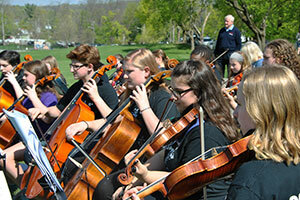 The event included speakers, an award to Roger Metzger, planting a Sesquicentennial Maple Tree, student music and more. In addition to dignitaries and special guests, the ceremony was attended by Park Avenue Elementary first graders, Principal Sandy Wood and teachers; Sanfordville Elementary first graders & PIE K/1 classes, Principal Johnna Maraia and teachers; and students from St. Stephen-St. Edward school. 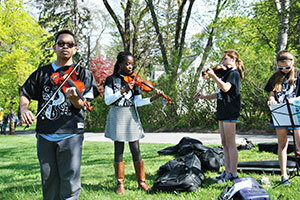 During the event, music was provided by talented student musicians. 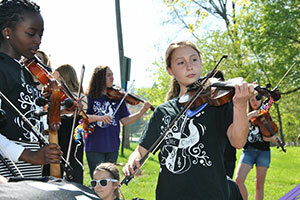 Warwick Valley Middle School music teacher Elissa Maynard conducted the Middle School Wire Choir, and Warwick Valley High School music teacher Keely Blaikner directed High School orchestra string ensembles in performing “America the Beautiful” and other pieces. Patricia Reinhardt, chair of the Arbor Day Committee and a member of Warwick Valley Gardeners, spoke about the origins of Arbor Day celebrations and how the idea, which quickly spread throughout the country, was first observed in Nebraska in 1872. During the ceremony, Orange County Legislator Barry Cheney, Town of Warwick Supervisor Michael Sweeton and Village of Warwick Mayor Michael Newhard each presented proclamations issued by their respective government offices to honor Mr. Metzger for his longtime service. 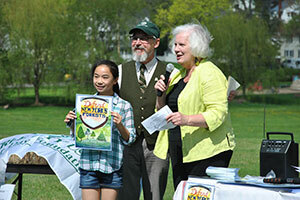 Middle School artist, Sarah Werner, spoke about how surprised she was to win the 2017 New York State Arbor Day Poster contest. 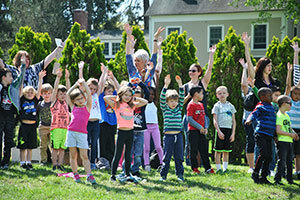 Craig Wadeson, who annually donates evergreen tree plantings from Wadeson’s Home Center to Park Avenue students, recalled his childhood memories of celebrating Arbor Day. Town of Warwick Historian Dr. Richard Hull spoke about the planting of trees in the history of the Village, and Geoff Howard and Mr. Newhard unveiled the “History Tree,” a special cutting of a 254-year-old tree, which had died as a result of Hurricane Sandy. Each tree ring, representing an important year in the history of Warwick or in general, was marked with a numbered and colored bead corresponding to the date and identification of the event listed on a chart. The “History Tree” will be displayed at local schools before its final location at the Warwick Historical Society’s A.W. Buckbee Center. At the end of the ceremony, teachers and other volunteers handed out evergreens to each child, and the children were invited to take turns shoveling some dirt to help plant the new maple tree.